I was talking to my colleague today at the Nice airport on my way back from Monte Carlo about cents and pennies; seems to me like coins of small denominations are all like furry little virile rabbits: if you've got a couple of 'em in your garden and you let 'em rub around a bit, pretty soon, you've got a bunch of 'em – like in your pocket or bag. Kinda like Star Trek’s Tribbles.... Have a couple of tribbles and let 'em rub around a bit near food and... before you know it, you've got a crazy big pack of troublesome tribbles. Hey! Didn’t you read the sign - don't feed the tribble! And don't feed the Gremlins after Midnight either. 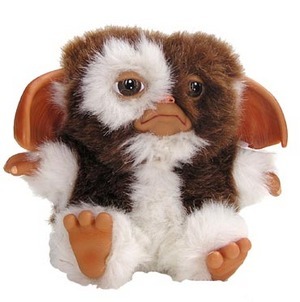 Let's face it, if you don't know what Gremlins are, you shouldn't feed them. Don't ever feed the Gremlins. Anyway, this kinda sounds like the track "Don't pay the Ferryman". Chris deBurgh, who also wrote "Lady in Red" Romantic drivel... dribble....Tribble-dribble! which is apparently more tribbles. If you feed a Gremlin, you get more Gremlins, which leads me to believe that Gremlins and Tribbles are just sweet, hairy balls of dump. I mean, food goes in... they come out.